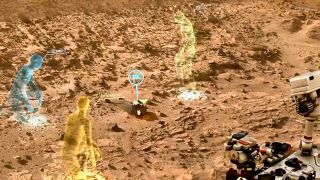 This view shows what OnSight, a new holographic planning tool using Microsoft's HoloLens technology, looks like when viewing the Martian surface. NASA will start using the technology to plan the Curiosity rover's Martian route at some point in 2015. Image released Jan. 21, 2015. Humans on Earth could soon plan a route on Mars for a rover by strapping on a virtual-reality headset. NASA is planning to do science operations with the Curiosity rover using software co-developed with Microsoft for its new wearable technology, the HoloLens. The software, which is called OnSight, will simulate the environment that Curiosity sees using data that the rover gathered on Mars. This will allow program scientists to examine the environment as if they were standing alongside the rover, NASA said. Using pictures for navigation is something Mars planners are very used to, and on occasion the Curiosity or Opportunity rovers will take pictures that can be converted into 3D stereo views. That said, it's hard for humans to see how far away objects are because depth is difficult to translate, even in 3D pictures of the planet. To get around this problem, OnSight will use "holographic computing" — technology that pairs virtual reality with real imagery — so that the planners can see the environment and better gauge distance. Scientists can even crouch to get a better look at a Martian rock. Mark Spoonauer, editor-in-chief of Space.com's sister website Tom's Guide, got to try out the OnSight tool firsthand during a test of the HoloLens. "I walked around the surface of Mars, bending down to take a look at a rock that may provide clues to an earlier wet history for the planet," Spoonauer wrote on Tom's Guide. "I also collaborated with a remote JPL scientist, who helped me take higher-resolution photos of a mountainous region with a few air taps. During our interaction, I could see his bright green avatar (which looked more like the outline of a human than the real thing), as well as what he pointed to as we chatted." The Jet Propulsion Laboratory plans to start using OnSight for Curiosity mission operations later in 2015. NASA also plans to extend that work with the forthcoming Mars 2020 rover when it reaches the Red Planet. You can read more about the HoloLens on Tom's Guide, Space.com's sister site.